Each year, the Unitarian Universalist Association chooses one or more books as a Common Read, asking congregations across the denomination to consider reading and discussing the same book in a given period of time. A Common Read can build community in our congregations and our movement by giving diverse people a shared experience, shared language, and a basis for deep, meaningful conversations. Justice on Earth: People of Faith Working at the Intersections of Race, Class, and Environment, edited by Manish Mishra-Marzetti and Jennifer Nordstrom (Skinner House Books, 2018). 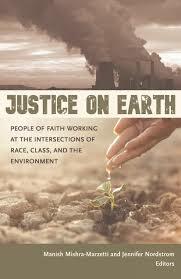 UUC will be holding a discussion group in January to read and process Justice on Earth. All are welcome to join our discussion group, meeting after the service on January 6, 13, and 20 in the Library. Registration is requested but not required. Register. This highly anticipated anthology presents a powerful and penetrating look at environmental justice from some of the key thinkers and activists in Unitarian Universalism today. Fourteen activist ministers and lay leaders apply a keen intersectional analysis to the environmental crisis, revealing ways that capitalism, white supremacy, patriarchy, and other systems of oppression intersect with and contribute to ecological devastation. They also explore how spiritual practices, congregational organizing, and progressive theology can inform faith-based justice work in the twenty-first century. These prophetic voices, from a wide range of perspectives, reveal new approaches and opportunities for more holistic, accountable, and connected justice efforts. Each essay is accompanied by suggested ways to take the next steps for further learning and action. Register for the discussion group. Order the book from the UUA Bookstore. Learn more about the UUA Common Read.